The Lover’s Lock is a Portuguese good luck piece worn by fishermen and their wives to preserve their deep love for one another. During the extended periods of separation, this remarkable amulet keeps their spirits united. And during times of stress or turmoil, the Lover’s Lock symbolizes the eternal bond and reminds the couple that temporary difficulties will soon subside. 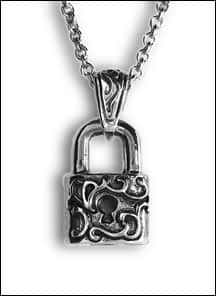 If your partnership is precarious and it needs to be reinforced, the Lover’s Lock necklace could be of immense help to you. It may remind both parties how important your commitment is to one another. The moment your loved one observes the Lover’s Lock, they could be reminded of the values of loyalty, faithfulness, companionship and lasting love. If you believe in the power of forces that are all around us, that can change our lives forever, then let the Lover’s Lock Necklace protect & secure your relationship. 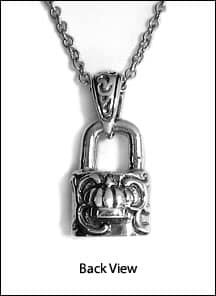 The Lover’s Lock Necklace is made of solid sterling silver. Thanks again for all of your help- my family, friends and I are all firm believers in your work! I placed an order using normal mailing, and to my astonishment I got my package in less than 2 weeks. I admire and thank your efficiency and speed. I will continue to be your client for sure!